"Mary Stevens, M.D." is one of many films about medical professionals produced during the pre-code era. 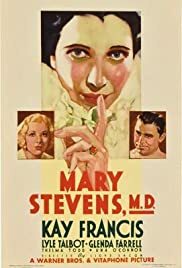 Mary Stevens (Kay Francis) is something of an oddity--a female physician. She has trouble getting clients at first, but specializing in pediatrics and her zealous commitment to medicine gain her a successful practice. Don Andrews (Lyle Talbot) plays the male doctor she falls in love with. But he marries a woman whose family has connections. In the first third of the film, she loves Don from afar and immerses herself in her practice. In the second third, Mary reveals her love to Don. He has a plan for divesting himself of his practice and his wife, but complications arise, so Mary sails to Europe, promising to come back when the path to their happiness has been cleared. I found the last third of the movie creepy in its cruelty. It's an interesting storyline, but not what I consider enjoyable. Nevertheless, Kay Francis is a striking actress. No wonder she became one of the biggest stars of the thirties and a fashion icon. Glenda Farrell, who plays the part of Glenda, her assistant, also has a strong presence reminiscent of a young Ginger Rogers. But the plot of this film is rather predictable and, therefore, anticlimactic. Francis and Farrell will have plenty of other vehicles better suited to their talents in the coming years. One novelty is the fact that the script seems afraid to say the word "pregnant" despite its pre-code production.